Those sneaky singing critters, tricksy they are. Really? They don't work at all or they spilled? 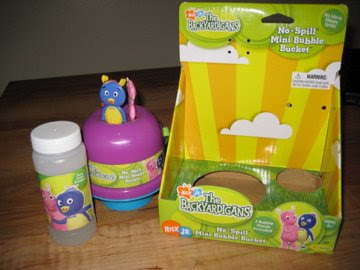 My kids have (non-Backyardigans) some like these and love them. Although I'm sure that K-man was able to spill some too. Yeah, I call these the 'spill less than the regular bottle' bubbles. If Princess is simply blowing bubbles and accidentally knocks it over most spillage is prevented. But if the object of her activity is to dump the bubbles out of the bottle then there will still be a mess. Plus, the wands still drip and make a mess. I'm a bad, bad momma. I refuse to buy bubbles of any kind- ever. Because I know that they will spill. I will, however, buy bubbles and take them to grandma's house. I guess I'm a bad, bad daughter too.